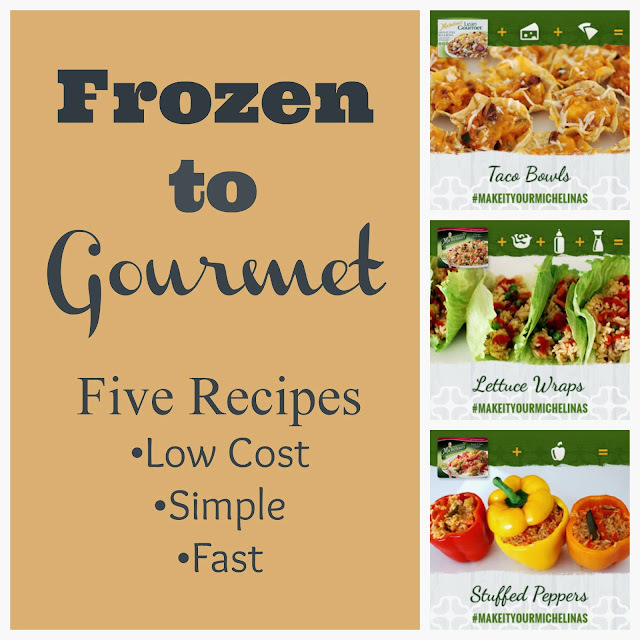 Life With 4 Boys: 5 Ways To Go From Frozen to Gourmet in Minutes! 5 Ways To Go From Frozen to Gourmet in Minutes! This post brought to you by Michelina's. All opinions are 100% mine. Honestly, I just don't have the time to cook gourmet meals for my family. In fact, you all know by now that I am a huge advocate of packing away a month's worth of freezer to crockpot meals at a time. Recently though, I was introduced to the Make It Your Michelina’s site, where you can find ideas to take plain old frozen meals from the regular and new Michelina's Lean Gormet® lines, and add a few other ingredients to create an amped up meal in a flash! I love the idea behind the 'Make It Your Michelina's' campaign, because it makes having a delicious and hardy dinner or lunch doable for just about anyone. All you need is frozen Michelina's meal, and then you just add in your own mix of extra ingredients. More veggies, bacon, sauce? It really doesn't matter, because it is all about making it your own and creating something new, delicious, and all at a great value! I plan to try out some of the great Michelina's recipes that others have created, and then I think I'll try my hand at creating my own delicious lunch recipe. Check out some of my favorites below. Do you have a recipe you use to turn a plan frozen dinner into a gourmet lunch? I would love to hear what it is. For more recipe on how to turn a frozen dinner into a gourmet meal, Follow Michelina's on Facebook and Follow Michelina’s on Twitter. I love the idea of this, I need easy. I've been thinking of looking into crock pot meals maybe coupled with some frozen items I can actually appear to be able to cook LOL. The idea of taking a frozen meal and making it more is so wonderful! I can't believe I never thought of this before. I like Michelina's for lunch. They are tasty and priced right. Never thought of using them to complete a dinner meal. I need to make those peppers! What a great idea! Those gyros are so creative. I'd really like to try some of these twists with Michelina! Yum good recipes here, I am gonna try those taco cups, so cute!! Everything looks so good! I would love to try those lettuce wraps! yum! EVERYTHING here looks so tasty!!!! Those lettuce wraps look pretty good. That would save a lot of time compared to making them from scratch. I really love the idea of gourmet meals for a month--that makes me smile! I need to get a larger freezer to accommodate a month's worth of meals for my family. They all look pretty good, well except the gyro with pasta in it, that one is a little silly... then again my mom used to eat spaghetti sandwiches. I made the lettuce wraps and they were very good. Oh my gosh. Every single one of those items looks delish. I've been craving some stuffed peppers lately, yum! I've never even thought of this. It's a great idea anytime, but especially this time of year when everyone is extra busy.